Nihilumbra 1.2 update is already available! - New languages (KOR, JAP, CN, PL). - Check your achievements in-game. Nihilumbra HD is now finally available on Steam! Yes! Steam! we are there, finally! hard to believe but in the end all the work we started doing a year ago, today has come to fruition! So here is what you, dear long-time supporter, and you, welcomed newcomer to our site (maybe thanks to the divine power of Steam), can find when entering the Nihilumbra Universe! Nihilumbra is a dark tale that takes shape as a solid puzzle platformer where you play as Born, a weird but also charming being that one day separated and grew up from The Void. The Void seems to hate your hunger for independence, so he goes after you, vanishing everything he finds on its way only to try to absorb you back. Your only weapon to make your way through the end of the adventure are the colors you find along the stages of the game, each one has a power to modify the scenario. The use of colors, along with the melancholic loneliness of the game game, sets the perfect mood to present some really challenging situations to the players. Also, is impossible to forget to mention the hand-drawn graphics and the moody and melodic music composed by the brilliant Álvaro Lafuente. As it happens in the first stage of the game itself, Nihilumbra for its own was a leap of faith, in a gaming universe oversaturated with words like "social", "casual", "free to play" or "in-app purchase", a few students wanted to make a game in the old fashion, something that you pay for once and enjoy for your whole existence. That's Nihilumbra, a game about existentialism, full of challenges and meaning. Released for iOS platforms in early 2012, the initial goal was to raise the quality bar to try to stand out from the average mobile titles in the always overcrowded AppStore. A year and a half after, we can say we achieved it, the great critic reception (remarking iTunes’ Best of 2012: Hidden Gem award) fueled us to port our game to other platforms, like PC, Linux and Mac, and in the future to platforms like Wii U and Android. We started out in March 2011 as a team of a few young graduate students from Barcelona who wanted to create something of their own, at the beginning there was no money there, only a passionated group of around 15 students who met once a week to try to shape their dreams into something truly enjoyable. As anyone may expect, in a few months that group of people became smaller and smaller, only the ones who really wanted (and could afford) to be part of that labour of passion remained. Then what it was going to be an amateur project turned into a professional work when Aniol, one of the four remaining members, purposed to invest his own savings in funding a real game company. 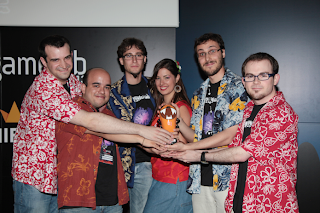 Then BeautiFun Games was born and a year later Nihilumbra became its first child. Now you can understand why today is a great day for us, we see how our efforts are starting to pay off, and this way are opening the door to new projects, new leaps of faith. Jesús Fabre. Freelance PR and Community Manager at BeautiFun Games. - Original soundtrack composed by Álvaro Lafuente. - Improved and Fully Remastered Soundtrack. - Reimagined and intuitive controls and menus. - Still NO achievements, DLCs or inapp purchases. - Improved atmospheric and weather effects. Thanks from all the BeautiFun Games team for all the positive feedback. Hope we can make our way to Steam, keep the votes coming!!! Tell it to your friends!!! And to your enemies too!!!! OFFICIAL ANNOUNCEMENT: Megamagic available on April 20th! I can't wait. Play before On mobile. Our new game Megamagic, Wizards of the Neon Age will be available on April 20th! Nihilumbra has been Greenlit and is now listed in the Steam store. For the latest information, purchase options, and discussions for Nihilumbra, please see it on the Steam Store or in the Steam Community.